I don't have a beef with Nike over their peddling of a "sports burqa". They're in the sports-gear selling business, and if there's a demand for this sort of thing, more power to 'em for being the supply. 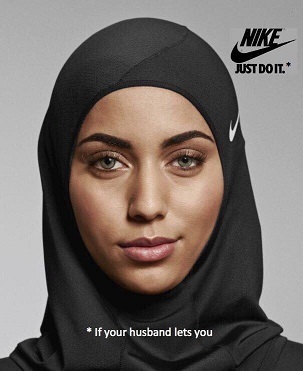 Can't say I'm a big fan of the idea of the burqa, but I don't think you can claim Nike is subjugating women or promoting Islamic patriarchy. Whoever's inclined to buy one of these is already wearing a burqa, most likely. Who knows, Nike may even expand their options. Look for a Catholic Nun sports wimple. The Mennonites or Hutterites or Vermiculites that have their young women wear bonnets will need a version, too.